Summary: Before college students head back to campus, they may want to consider signing an advance directive for health care and a financial power of attorney. With 250,000 young adults hospitalized each year with non-lethal injuries, it is a good idea for students to have a plan in place concerning their medical preferences. It is August, which means that teenagers headed off to the college for the first time are busy with last-minute shopping, packing all of their belongings, and making sure their class schedules are set. There are two more items to consider before leaving for school: signing an advance directive for health care and a financial power of attorney. 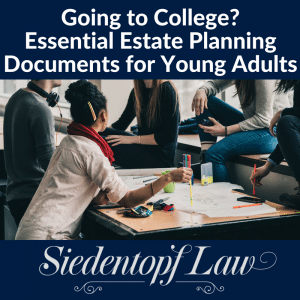 While these two estate planning documents may seem like issues for later in life, they can be essential for younger people, as well. Advance Directive For Health Care. An Advance Directive for Health Care is a form in which a person lists his or her health care preferences in detail (ex: treatment, medical testing, care options). It puts family members, doctors, and hospitals on notice – and is only used if the person is unable to communicate his or her own wishes. In the advance directive, an individual can designate a Medical Power of Attorney (also known as a health care agent) to make health care decisions. A medical power of attorney can look at someone’s medical records, speak to their doctors, and make decisions about any medical testing or treatment. While college students are generally healthy, no one knows if or when we will become incapacitated or otherwise unable to make decisions about life-sustaining treatment. An advance directive memorializes a person’s choices and allows them to be firmly in control of their own medical treatment. It can also provide family members the peace of mind knowing that their loved one’s wishes are being followed. Without a medical power of attorney in place, parents will likely not be able to make urgent health care decisions for their children once they turn 18-years-old and might need court approval to act of their child’s behalf. For more information, you can read part one and part two of our blog series on advance directives for health care. Siedentopf Law also has a blog on How to Choose Your Medical Decision Maker. Financial Power of Attorney. This document enables a person to act on your behalf in the event of your disability. A power of attorney can manage financial and legal affairs including bank accounts, credit cards, property leases, digital assets, and other matters. In case of emergency or incapacity, a financial power of attorney can manage financial accounts, pay bills, transfer money, or even sign a legal document. A person can choose when the Durable Power of Attorney forms go into effect (ex: immediately, at a specific future date, only under specific circumstances). If a someone becomes sick or incapacitated without a power of attorney in place, the court may appoint a conservator to decide what happens to your assets – and it is possible that he or she may not make the financial and legal decisions that you would prefer. For more information about financial power of attorney, you can view our blog on the “Must Have” Estate Planning Documents. With approximately 250,000 Americans between the ages of 18 and 25 hospitalized each year with non-lethal injuries, it can be a good idea to have a plan in place concerning your medical preferences and your medical decisionmaker. For help with an advance directive for health care, a medical power of attorney, or any other estate planning or probate question, contact Siedentopf Law at (404) 736-6066 or Sarah@estatelawatlanta.com.